I’ve been busier than a 16 armed Octopus! So many great things on the horizon! 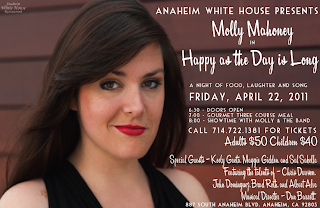 In addition to putting on productions of “Peter Pan”, “Mary Poppins” and “Into the Woods” and teaching all around town… I’ve also been working on a show of my own at the Anaheim White House. It’s set for April 22nd. Just around the corner! The show titled “Happy as the Day is Long” has a kickin band, 3 great guest artitsts, AND a 3 course meal. And, to top it all off, a super talented friend designed flyers! I’m planning on using both flyers, but I’d like to choose one to use for advertising with people who I don’t know. I’d love your help deciding between the two. I love them both, but choose #2! Those are TERRIBLE! This “friend” of yours should have photoshop taken away from her. I bet she even forgot important things like the address. Hey Molly…I love the second one…that lipstick just pops……. AWESOME I WANT TO SEE HER PERFORM CRAZY!! !